Do you have an unfinished basement that’s under-utilized? Want to turn that wasted space into something the whole family will enjoy, like a rec room, a play room or a home theater? Maybe you need to find space for a home office, or have visions of the ultimate man cave dancing in your head? Or perhaps you basement is finished and already serves its purpose, but in desperate need of an upgrade? Whatever you have in mind, Beyond Custom will make your basement remodeling dream a reality. We are a full service contractor with experts in both exterior and interior builds and remodels. We know how to create and design terrific spaces whether large or small. And basement remodeling is one of our specialties. At Beyond Custom, we understand completely. We take great pride is basement remodeling that is stress-free, well within your budget and finished in a timely manner. It can be tough knowing which Chicago area contractors to go with. Who can you trust? Which has the best reputation? Is the lowest bidding contractor really the best choice? Is the most expensive contractor necessarily the best contractor? Choosing a contractor by lowest bid alone, however, can often be the most expensive choice. When the bid is dramatically low, that’s a red flag. Bottom-of-the-barrel bids overwhelmingly result in nightmarish overruns in time and spiking costs you didn’t expect. And the finished product? Disappointing may be an understatement. On the other end of the scale, choosing an expensive contractor is no more of a guarantee for great results than the lowest bidder. The high-end contractor may deliver on reasonable quality, but the mark-up is frequently a sky high gouge that cheats you of getting a great job done with value, respect and integrity. We’re Beyond Custom and our name says it all. Based in Elgin and serving the Chicago area and surrounding counties, our aim is to deliver the exact basement remodeling project you want with nothing you don’t want. And we do it with fair, honest pricing that respects your budget. At our core, we are in the people business. Happy customers keep Beyond Custom thriving. So we don’t come at your basement remodeling project with a “this is what you need” sales attitude. And our diversity as a custom builder and remodeler means we won’t try to shoe-horn you into a one-size-fits all solution for our convenience or pressure you with an up-sell on features, overhauls or products that you neither need nor want. We’re full-service remodelers. That means we do it all, and that means we aren’t the kind of contractor that pressures you to accept solutions that are better for the contractor than for you. So, from the first person you speak to when you call us, to our designers and builders, we pay attention when you talk. We learn what you want and what your budget allows. Then we offer expert advice and options that work with your unique needs, plans and expense account. Project Quotes. When we give you a quote on your basement remodeling, it is iron-clad. We put it in writing, and you won’t pay a penny more. But, perhaps, you think: What if I change my mind? What if I want something that goes beyond the original scope of the quote? No problem! An updated quote will be worked up and honored in just the same way. Schedules. A well thought out schedule is a time and budget saving schedule. We provide you with a realistic schedule and we stick with it. We have all seen contractors who vanish for days at a time, right in the middle of a project, haven’t we? No explanation and a weak commitment, if any, on when they’ll return. Beyond Custom is not one of them. From start to finish, you’ll know our day-to-day schedule and the projected timeline. We will never leave you guessing. Ever. Living With The Project. During your basement remodeling, we do everything we can to minimize noise, dust, and disturbance. Any remodeler that is honest can’t claim they can totally eliminate these. But we at Beyond Custom are proud of our unfailingly polite crew members who always remember there’s a family living upstairs. We treat your house as a home first and a job-site second. For Beyond Custom, this is the foundation of our business philosophy. In our opinion, pride in workmanship and business is never found in raw profits or how quickly a job can be gotten in and out of so the next project can be slapped out. Our pride is in giving our customers the beautiful result they expect, and in knowing every detail was done right. Of course, we understand that even though we strive for perfection for our customers, we’re not perfect! So if something doesn’t go right and we know about it, we will never cover it up. If something doesn’t go right and we don’t know about it, we want to hear from you! We will fix it to your satisfaction. Is that an obsession with perfection? We think of it as more of an obsession with customer satisfaction. Happy customers are repeat customers. Happy customers also tell their friends about us, bringing us new business. If for only those reasons, any contractor should strive for 100% customer satisfaction. At Beyond Custom we enjoy stress-free, happy experiences as much as our customers do. What better way to make both our customers and ourselves happy than to make sure everything meets or exceeds our customers’ expectations? From the “little” stuff (“little” doesn’t mean “unimportant,” after all!) to the monumental and obvious, to the final walk through and meticulous clean up, your satisfaction is our bread and butter. Beyond Custom Is Ready When You Are! 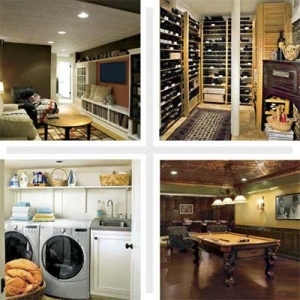 What do you want from your basement remodeling? A home office, a man cave or gym? Prefer a rec room, a play room or home theater? Or are you dreaming of something entirely different? For any design, for any purpose, Beyond Custom in Elgin serves the Chicago area and is ready to listen to your dreams and make them a reality. Call us today at (630) 806-1690 or use our Contact Us Page to arrange for a no-pressure consultation. We look forward to hearing from you!